The Alchemy series has a variety and shapes, from large and small squares and rectangles of sizes per sheet in several color patterns. The hand painted pattern, provide a dazzling look that is sure to gain attention in any area. 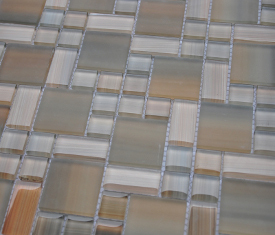 Create depth and shading in your kitchen, bathroom, or outdoor settings with the Alchemy glass tile mesh mounted sheets.